Feel the great expansive openness of the West Coast with its big blue skies and its ever developing but still youthful capital city of Perth. You will be personally met at the airport by a DISCOVER AUSTRALIA representative and transferred from the airport to your hotel. You can relax and use the rest of the day to explore your hotel and its facilities, perhaps take a stroll around the neighbourhood and central Perth. Meet and Greet Personalised Arrival Transfer, Overnight Perth Accommodation. Beautiful Fremantle lies just 30 minutes from Perth, this historic port city with a bohemian vibe is home to exquisite colonial architecture and a lively night-life, attractions include scenic Fishing Boat Harbour, Fremantle Prison, WA Maritime Museum and Fremantle Markets, imbibe a boutique beer at a micro-brewery and swim at beautiful Bathers Beach. Let us show you the sights of our beautiful city of Perth to get your bearings and benefit from the informative commentary. It's a true welcome to Perth. This three and a half hour tour takes in most of the city's major attractions plus takes you to South Perth across the Swan River and along Perth beaches. Now you have a good orientation and knowledge of the Perth area, you can return to soak up some places at your own pace. 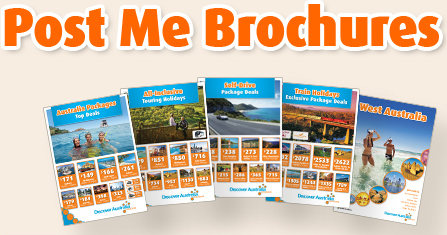 Don't forget your DISCOVER AUSTRALIA Bonus Voucher Book for amazing discounts and bonuses. The bohemian port town of Fremantle has a unique feel and distinctive cafe lifestyle. See the amazing colonial architecture and experience Fremantle. En route to Fremantle take in the views from the "Tree Top Walk" in King's Park and travel along some of Perth's finest beaches. Travel back to the city alongside the Swan River. 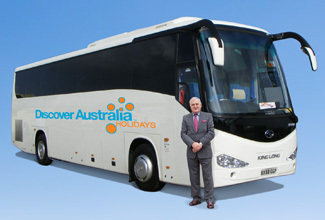 (Half day luxury coach tour). This amazing Special Holiday Package represents unbeatable value and choice. The beautiful city of Perth is modern, cosmopolitan and vibrant, the city is home to lively bars, restaurants and cafes and has an eclectic arts and cultural scene, attractions include beautiful Kings Park, the Swan River, newly opened Elizabeth Quay and the nearby Swan Valley wineries and the historic port city of Fremantle. Spend the day exploring Perth on your own. You will be personally met at your hotel by a DISCOVER AUSTRALIA representative and transferred from your hotel to the airport for your flight to Broome. Meet and Greet Personalised Departure Transfer, Flight to Broome, Overnight Broome Accommodation. Broome is home to a proud pearling history, this vibrant and cosmopolitan town exhibits its past in the Japanese Cemetery which houses the remains of perished Japanese pearl divers, visit restored luggers in dry dock and see exhibitions of old diving gear, Broome's Chinatown is home to some of the world's finest pearl showrooms. Enjoy a 2.5 hour Broome township tour this morning with hotel pick up and experienced local guides. Discover Cable Beach, Gantheaume Point, the Japanese Cemetery, Town Beach, Sun Pictures, Matso’s Brewery and a Pearling Masters High Tea. Later spend the afternoon at your own leisure. Broome Luxury Coach Tour with Hotel Pick up, Pearling Masters High Tea, Overnight Broome Accommodation. The historic, vibrant and cosmopolitan town of Broome lies under perpetually sunny skies, the town has a proud pearling history and has many attractions exhibiting it including the emotive Japanese Cemetery which houses the remains of perished Japanese pearl divers, other attractions include the Courthouse Markets and Matso's Brewery. Explore Broome at your own pace and discover everything the town has to offer. Make your way to Broome Airport for your flight home after your Western Australian adventure. You have 3 choices of accommodation in Perth and Broome. Our "Good Standard" central Perth and Broome hotel has great facilities, a comfortable room and friendly service (typically 3.5 stars). Alternatively, why not treat yourself? The "Deluxe" hotel has superior facilities, stylish room and first class service (typically 4 stars). The “Luxury” hotel is upscale with a more luxurious feel for the discerning traveller and great for celebrating an anniversary (typically 5 stars). You will be personally met by a DISCOVER AUSTRALIA representative and transferred from the airport to your hotel and from your hotel to the airport for your flight to Broome. You will be met upon arrival in Broome and transferred to your hotel and from your hotel to Broome airport for your flight airport for your flight home. The Perth and Broome Discover is very popular. Many dates book out well in advance, please book soon. Add an extra nights accommodation in Perth along with a cruise to Rottnest Island including a guided coach tour of the Island and a Special Lunch. Meet the famous quokka, the happiest animal on earth, discover the fascinating history, explore amazing beaches, see unique flora and immerse yourself in the laid-back friendly holiday vibe.